The Bisons added another big bat to their lineup, but the RailRiders kept hitting as well in a 9-5 victory over the Herd, Sunday afternoon from PNC Field. The addition of Richard Urena from Toronto helped Buffalo collect 13 hits, but couldn't prevent Scranton/Wilkes-Barre from completing the four-game sweep over the Bisons. 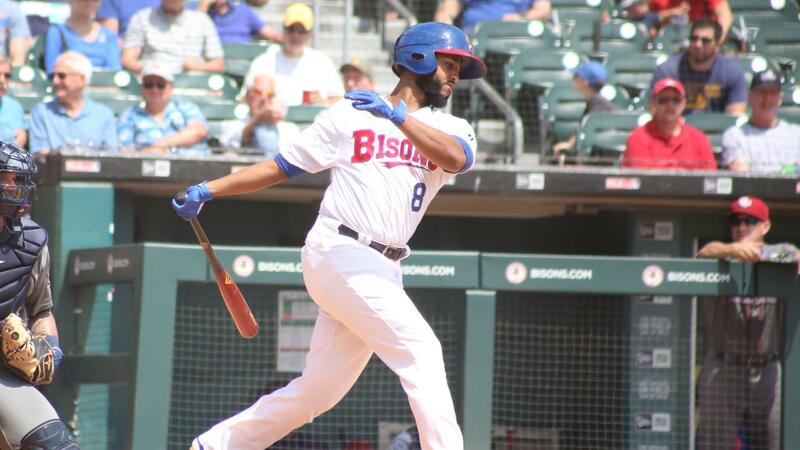 Optioned by the Blue Jays on Saturday, Urena made his first 2019 Bisons start a day later and collected two hits, including a two-run RBI-triple in the seventh inning as the Herd attempted to come back from seven runs down. Urena was one of five Buffalo batters to have multi-hit performances, include another three hits from Vladimir Guerrero Jr.
Vladdy went the opposite way for a sharp single to right in the first inning and scored three batters later on Patrick Cantwell's single to open the scoring. Guerrero Jr. then blopped a second single to open the third inning, but was left stranded. The top prospect in baseball then followed Urena's triple in the seventh with an RBI-single. However, those three runs came when the Bisons were down 9-2 and they would get no closer in their seventh consecutive defeat. Scranton/Wilkes-Barre's offense was rolling again Sunday, with nine more tallies to give them 32 runs in the four-game sweep. Mike Ford and Gosuke Katoh each drove in runs against Herd starter David Paulino in the first inning for a 2-1 lead, while Ryan McBroom and Kellin Deglan hit homers in the fourth inning for a 5-2 advantage. Ford hit is fifth home run against the Bisons already this year to lead off the fifth and added a sacrifice fly in the sixth inning. Ford finished the game 2-3 with two runs scored and three RBI. Paulino fell to 0-1 on the season after allowing five runs in 3.2 innings of work. Gio Gonzalez rebounded nicely for the RailRiders after the Bisons beat the veteran on opening day. The southpaw struck out eight over five innings to improve to 2-1 on the year. The Bisons will now travel to Pawtucket for a three-game series against the PawSox.